Product Consists : Hand Bunch of 30 Mix Flowers, 1/2 Kg Pineapple Cake along with 12 Inches Teddy Bear. You will fall in love with these awesome gift hamper without a doubt! These hampers include colorful seasonal flowers look really warm and passionate and will delight any recipient. This gift contains thirty colorful mix flowers like Roses, Gerberas and Glades these have been immaculately packed in cellophane. 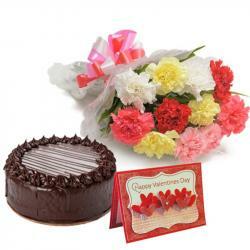 These flowers can be used as nice gifts of a variety of occasions but especially for love expression. This hamper includes Yummy Fresh cream pineapple flavor cake. We ensure they will enjoy the juicy and creamy treat of pineapple cake. Also adore your dear ones with very cuddly bear. 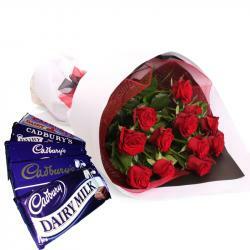 This is complete love hamper suitable for Valentines Day gifting. So gift it now to your special person in India. 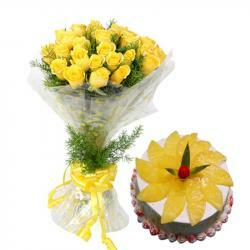 Product Includes : Hand Bunch of 30 Mix Flowers, 1/2 Kg Pineapple Cake along with 12 Inches Teddy Bear.